Summer is arriving in the northern hemisphere, bringing warm weather. 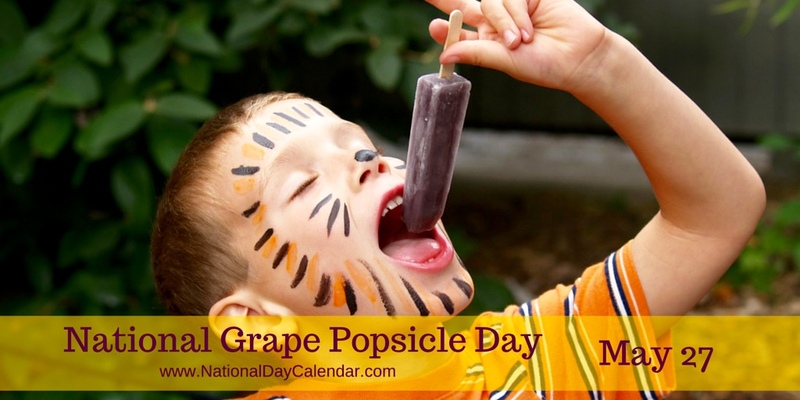 Today, May 27, is National Grape Popsicle Day. According to http://www.nationaldaycalendar.com this all began in San Francisco, California in 1905. They say that 11 year old Frank Epperson was outside on his porch, mixing water with a white powdered flavoring to make soda. Upon going inside, he left it there on the porch with the stirring stick still in it. That night the temperature reached a record low and the following morning, Frank discovered the drink had frozen to the stick. The Popsicle was born. It is a warm weather favorite for all ages and comes in many flavors. Today perhaps we will enjoy a Popsicle. We ducks really like this human invention. Let’s get some, mom. This entry was posted in Holidays, Uncategorized and tagged Colorado Traveling Ducks, Frank Epperson, National Grape Popsicle Day. Bookmark the permalink. It never occurred to me to wonder who invented popsicles. I’m glad Frank did! I’m glad too. Ate many as a child and still enjoy them in the hot weather.